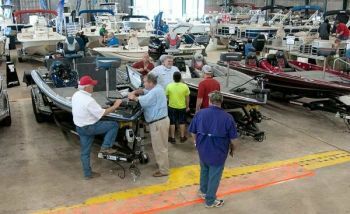 The Louisiana Sportsman Show has always included a full complement of boat dealers, but this year’s show scheduled for March 17-20 will provide an even greater focus on the latest boat offerings.The Louisiana Sportsman Boat Show sponsored by Essential Federal Credit Union that will be held at the Lamar-Dixon Expo Center in Gonzales in conjunction with the Sportsman Show will include 18 boat dealers in a dedicated 75,000-square-foot building. The show will include dealers’ offerings for both fresh and saltwater fishing applications, but that’s not all. “We’ll also have a full range of duck-hunting boats, along with kayaks and pontoons,” Fisher said. And the best part is that entry to the Louisiana Sportsman Boat Show is included in the general admission price of the Louisiana Sportsman Show. “This way, you can check out all the boats, but move back and forth to the main show to see what fishing tackle and hunting accessories are available,” Fisher said. “You also can check out all the special events, like the Louisiana Sportsman Big Buck Contest, the Fetch-n-Fish Tub and the Yamaha ATV Test Track. Highlights of the show will include all the major boat brands and dealers from throughout the Baton Rouge area; acres of fishing tackle and hunting gear for sale; an extensive display of ATVs and off-road vehicles; a dedicated tractor and outdoor power equipment area; the Louisiana Sportsman Big Buck Contest; Splash Dogs; a Kids Zone; a Yamaha ATV test track; a bass tank, where pros will be giving regular seminars; fishing and hunting outfitters from across the United States and an improved food court featuring three times the selection.